A large, authentic 5.00 Carat emerald-cut 11mm x 9mm London Blue Topaz gemstone is set in a classic 14k white gold setting accompanied by two genuine 0.15 Carat baguette side diamonds for a total of 0.30 carats of high quality H Color, SI1 Clarity Diamonds. 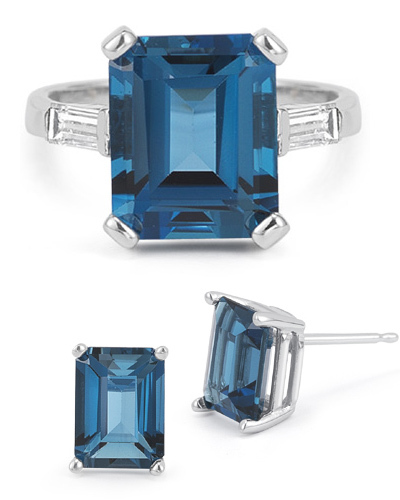 An authentic emerald-cut 8mm x 6mm London Blue Topaz is set in a classic 14k white gold basket settings. Each London Blue Topaz weighs 1.70 carats for a total of 3.40 carats. We guarantee our Emerald-Cut London Blue Topaz Ring and Earring Set to be high quality, authentic jewelry, as described above.